Background: Voluntary influenza vaccination of healthcare workers (HCW) has been only moderately successful. Mandatory programs are thought to require significant preparation and have been challenged. We successfully implemented in December a policy requiring influenza vaccination of all HCWs, or wearing a mask throughout flu season. Methods: Our 327-bed tertiary referral teaching hospital and large ambulatory clinic is staffed by over 6100 salaried employees, trainees, and volunteers. Influenza vaccine was offered free of charge to all HCWs, beginning Oct 1, 2010. A signature was required accepting vaccination, attesting to receipt of vaccine elsewhere, or declining. If declined, a reason was solicited but not required. Compliance data were entered into PeopleSoft by unit managers, with weekly monitoring and feedback. On Dec 6, 2010 senior leadership adopted a policy making vaccination mandatory for all HCWs. Education was provided on intranet, in meetings, and in individual communications. Consultation with an allergist or neurologist was offered in case of past adverse vaccine reaction. After Jan 1, 2011 HCWs declining vaccination were required to wear a surgical mask at work within 6 feet of another person, excepting meal times; failure to follow the policy was grounds for termination. Results: At baseline (Dec 6), 69.5% of colleagues had been vaccinated. In 4 weeks this rose to 86.3%; by 8 weeks 95.7% of HCWs were vaccinated (84.6% on-site, 11.1% elsewhere). Physicians (98.1%) were more likely to be vaccinated than nurses (95.1%) or others (95.5%) (p<0.001); 100% of 89 senior leaders were vaccinated. 20 Allergy and 2 Neurology consults were performed, with 20 vaccines safely administered, 1 moderate allergic reaction, and 1 declination. 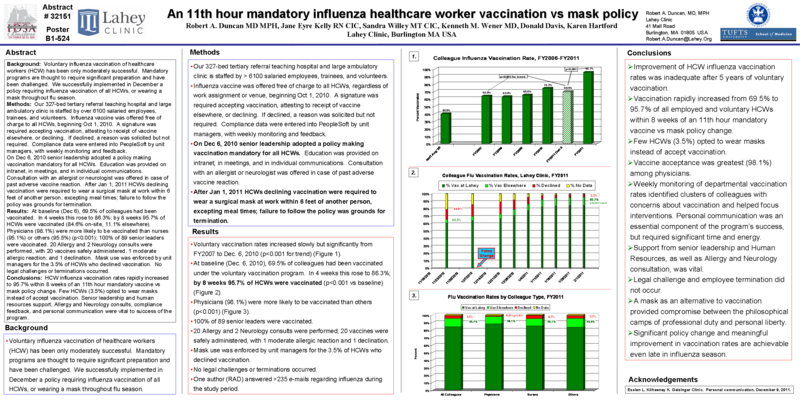 Mask use was enforced by unit managers for the 3.5% of HCWs who declined vaccination. No legal challenges or terminations occurred. Conclusion: HCW influenza vaccination rates rapidly increased to 95.7% within 8 weeks of an 11th hour mandatory vaccine vs mask policy change. Few HCWs (3.5%) opted to wear masks instead of accept vaccination. Senior leadership and human resources support, Allergy and Neurology consults, compliance feedback, and personal communication were vital to success of the program. Findings in the abstracts are embargoed until 12:01 a.m. EST Thursday, Oct. 20 with the exception of research findings presented at IDSA press conferences.